A classic cupcake given a modern decorative twist – who doesn’t love a unicorn at the moment? Pre-heat the oven to 160°C (fan)/350°F/gas mark 4. Place the margarine, sugar, flour and eggs into a mixing bowl. Beat to combine using an electric mixer. Fold the sprinkles (optional) into the mix and divide the mix evenly between the muffin cases. 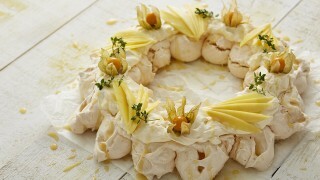 Place the softened butter into a large mixing bowl, sift the icing sugar into the bowl and beat to form a smooth icing. Add the vanilla extract, milk and a couple of drops of pink food colouring, mix well. 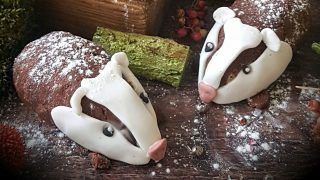 Place the buttercream into a piping bag fitted with a star nozzle. Pipe a rosette of buttercream on top of each cupcake. Asking an adult to help, use a serrated knife to remove the base from each ice cream cone to make your unicorn horn. Cut the liquorice using scissors to make eyes and eyelashes for your unicorn. 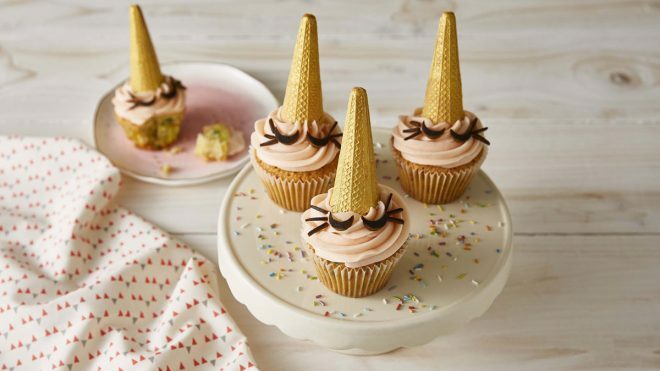 Decorate each cupcake with the ice cream cone horn and liquorice eyes. 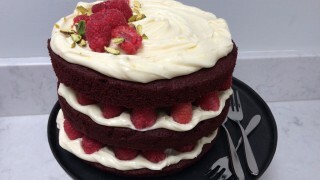 Place on a cake stand to serve and enjoy. Reserve the trimmed ice cream cone bases. Place in a freezer bag and crush using a rolling pin, mix with extra sprinkles and sprinkle over scoops of ice cream for a crunchy topping.